Our Team - Meet the Owner - Synthesis Engineering Services, Inc.
Eldon received his Mechanical Engineering Degree from Brigham Young University. After school, Eldon worked with Ford Motor company in Detroit for several years in the Advanced Powertrain areas doing research and design. It was a privilege to work on future automotive powertrain projects requiring the creation of new technologies. (Several patent awards came from that work.) Areas of focus included electro-hydraulic control systems, mechanical clutches, linkage mechanisms and system level functional design & analysis. Eldon left Ford for the Rocky Mountains of Colorado and to collaborate with an engineering research team in the development of a new line of mill discharge slurry pumps. Big stuff. (Slurry pumps are big centrifugal machines that pump rocks.) The blue pump here is a first production unit with a 10″ intake, and an 8″ pipe discharge. That machine, in steel of course, weighs enough to crush most pick-up trucks. 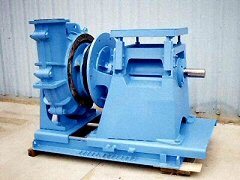 By applying new technology in both manufacturing and design to a relatively mature industry, a new pump with superior efficiency and wear characteristics was born. It made a “splash” by increasing efficiency ~ 18%. It also drastically improved wear life. The application of sound engineering principles like flow dynamics, computer driven channel shapes, and Statistical Design of Experiments (DOE) directed the design to an outstanding new product. In 1996 Eldon branched out as Synthesis Engineering Services, inc.. Since then he has focused his engineering, artistic and creative talents on developing products and new technologies for numerous customers. There is a great deal of satisfaction that comes from creating new products, with new technologies, then seeing them successful in the marketplace. There is also a great deal of satisfaction in having delighted customers. For samples of the work, please visit the Product Design Slide Show. (We would love to show more, but much is confidential, so a few samples will have to do.) Or, for the full screen view, visit our presentation site. Patents are a big part of the work, with many awarded, more pending and always more in the works. 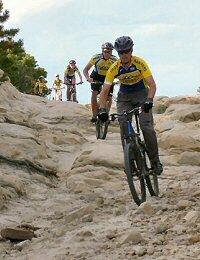 These patents cover areas from mechanical linkages, to pump systems, to hydraulic control systems, to mechanical clutches, to chainrings, to suspension systems, to bicycle derailleurs, to artistic designs and full system logic layouts, and more. For more information, see the list of patent numbers and short descriptions. For Eldon, engineering is more than just work, it’s a way to have fun! In the picture he is seen with one of his passions — a motorcycle streamliner he designed and built for the Bonneville Salt Flats. He also uses his engineering skills in hobbies like bicycling, audio systems, rock climbing and computers. Inventing and creating new and better things is all part of the course. These days it is not uncommon to see Eldon out testing new bicycle component prototypes built for one of several bicycle industry customers; . . . or to see him with the Front Rangers Juniors Cycling Team he coaches . . . or both. Cycling is a passion too, and what’s better than putting creative energy toward something you’re passionate about? Yes, that’s what he says. As the owner of Synthesis, it’s a privilege to share the knowledge we gain. We are citizens of the world, and we believe growth for everyone comes with sharing. So, Eldon writes, as a way to share. See the growing technical library as well as the Engineer’s Perspective, and the Mechanic’s Post. All are a good source of ideas for engineers, inventors, DIYers and other interested readers. And, almost everything on the WickWerks site is published by Eldon including the technical articles, guides, and “How to” videos. Get to know Eldon a little better by visiting Linkedin. Or, to meet personally, call or email now. You will discover that the skills and determination of the owner set a course for excellence. Your decision to work with Synthesis Engineering Services is one of the best you will make. Finally, to see more of what’s up, check out the Synthesis & Mechanical Elements YouTube Channel.